It’s no secret that the French know everything there is to know about skincare. They are world-renowned for their pharmacy brands (Avene, La Roche-Posay, Nuxe, the list goes on), and are known to be the leaders in the skincare innovation (see: the world’s first Epidermologist, Joelle Ciocco. 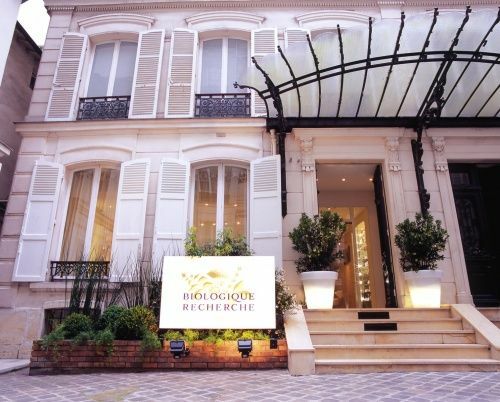 However, Biologique Recherche takes it to a whole other level. Their exclusive spa off the Champs-Elysées is in the little black book of every editor and make up artist around the world. Their treatments and products aren’t cheap either–they’re known as the Hermès of skincare for a reason. One woman from Town & Country magazine took part in their “Haute Couture” program, a personalized regimen that is updated every month by BR, that costs $12,500–the price of a Birkin. You’ve heard me talk about their ultimate exfoliating toner, P50, here before. While being extremely hard to find (I had to convince BR’s American PR company to send me a bottle) and smelling of onions, it is also very effective. Containing lactic acid and magnesium, P50 is the cornerstone of BR’s vast range of skincare products. This past week, Biologique Recherche launched their brand in Canada. Their facial treatments are products will now be available across the country in Toronto, Montreal and Manitoba (and soon, Oakville) at select spas and plastic surgery clinics. Last week, I had the privilege of being invited for a BR facial along with an interview with two of the brand’s founders, Dr. Allouche and Pierre-Louis Delapalme. I was ushered into a treatment room at One to One Studio by the wonderful Ellis Holevas (National trainer for BR in Canada), and was told that Dr. Allouche himself would be doing my skincare consultation. I was immediately struck by the sheer volume of BR products lining the counter and shelves. So. many. options. After Ellis cleansed my face, Dr. Allouche breezed in, the ever-charming Frenchman to take a look at my skin. I was either expecting to hear that my face was a total disaster (my skin is still purging from the new addition of Differin into my skincare routine), or that it was so-so. The reaction I received from the doctor was not at all what I was expecting. After pressing my hand, he took a look at my skin. “Well, OK, you have lots of hormonal breakouts then.” (This I could agree on). “Well, the doctor just prescribed me retinol”, to which he immediately made a disapproving face. I asked him what was wrong with retinol. “Nothing, nothing. It is not the best, but if it works for you, keep using it”. Well…OK. He looked to Ellis and rapidly lists off instructions in his French-inflected English of what she is to use on my skin–different masks, their “Soin Lissant” of course, a P50 toner, and to mix a mask with baking soda. I barely caught any of it, Ellis is a true pro. After the usual cleanse and tone, Ellis proceeded with the Soin Lissant, starting on the right side of my face. It was the deepest and most thorough lymphatic and facial massage I have ever experience. Once she was done with my right side, she asked if I would like to take a look–and admittedly, I was a bit confused as to why I would want to see my face mid-facial–but when I looked in the mirror, it looked as if my cheekbones had been lifted and injected with filler. I kid you not. The right side of my face was noticeably fuller. It was so incredible. She then applied a mask to the one-half of my face (Masque Vivant), and went to work sculpting the other half. She has the most miraculous hands–with expert fluttery movements of flicks and applied pressure, she was able to remodel my face as if it was made of clay. I don’t need to tell you that I will be massaging the crap out of my face now at home (even in my amateur fashion with fingers and my massage roller). Then 2 additional masks were layered on top of each other, and she went to work massaging my arms. Pure heaven. Once I came out of my massage coma, I was able to have my chance to meet with Dr. Allouche and Pierre-Louis. Unfortunately for me, the journalist in the time slot before me ate up most of my allotted time with them (I was only able to meet with them for 10 minutes, as opposed to 30). “So tell me…what do you have against retinol?”. “No no, nothing, nothing, just it’s not the best but if it works for you, continue using it. But our method would work too, it might just take a little longer”, says Dr. Allouche. “We have seen the results from our tests in Thailand, the were extraordinary”, says Pierre-Louis, “they have terrible acne in Thailand, you know, all of the spicy foods, it creates inflammation”. I had no idea about this. Note to self: cut down on chili flakes, salsa and hot sauce ASAP. “Of course, all acne is different, I would not treat an adolescent’s acne the same way I would treat yours, but we could do it. With the P50 and regular visits en cabine (facials), we could do it”. I ask how often these visits would be. “Well, at first once a week, then once a month. The skin changes so often, you know, and it constantly needs to be assessed. This is why we do the “Skin Instant” before the treatment. We do a visual assessment of your face at that moment before it is treated in the cabine“, says Delapalme. I mention that I noticed that there wasn’t any steaming or extractions during the facial. “No, no, it is too harsh on the skin. Using lasers and metal tools on the skin is like using a laser to cut butter, it’s unnecessary. The skin is so delicate”, says Delapalme. I also noticed that there were no scrubs included in their product catalog. “No, mechanical exfoliation is not needed for the face, we have a product with mechnical exfolation for the body, but not for the face. The P50 is enough”, says Delapalme. Convinced to reincorporate BR into my skincare routine, I purchase a few of (the many) products that Dr. Allouche prescribed for me, the toner (the gentlest version, for now), of course, and a moisturizer that promises to rebalance sebum secretion (sounds gross). The two set me back nearly $200. “We want to be exclusive, we don’t want to be everywhere. We want to stay professional”, said Dr. Phillipe Allouche, one of the founders of Biologique Recherche. Well, you’re certainly top shelf skincare, that’s for sure. Biologique Recherche facials and the entire product range is now available in select cities across Canada. In Ontario, you can find BR in Toronto at One to One Studio, and soon in Oakville at Briarwood Cosmetic Surgical Centre and at Heritage Way Medical Spa. Update: I received more addresses from PR. Just stumbled upon your post. But wow, I’m so jealous….the opportunity to have a BR facial, buy their holy grail products, and actually interview Dr. Allouche…amazing!